United States Secretary of State Rex Tillerson has called for Iranian-backed militias, who helped defeat the Islamic State in Mosul, Iraq and have reportedly set up checkpoints in Iraqi villages once predominantly populated by Christians over three years ago, to leave Iraq. At a press conference in Riyadh on Sunday, Tillerson stressed that now that the Islamic State has been pushed out of its stronghold in Mosul and the surrounding Nineveh Plains, "all foreign fighters need to go home." "Iranian militias that are in Iraq, now that the fight against Daesh and ISIS is coming to a close, those militias need to go home," Tillerson stated during a joint news conference with Saudi Foreign Minister Abdel Jubeir in Riyadh, according to Reuters. "The foreign fighters in Iraq need to go home and allow the Iraqi people to regain control." Tillerson is in Riyadh to meet with Iraqi Prime Minister Haider al-Abadi and King Salman of Saudi Arabia to discuss cooperation in the region and to discuss the Iranian influence in Iraq. The meeting comes as Iran is supporting the Shia paramilitary force Hashd al-Shaabi, also known as Popular Mobilization Forces, which is being advised by Iranian Quds commander Qassem Soleimani. CIA Director Mike Pompeo has said that Soleimani had been seen on the ground in Kirkuk, a province which the Iraqi Army recently took full control of from Kurdish peshmerga forces. "The president has come to view the threat from Iran is at the centre of so much of the turmoil that bogs us down in lots of places in the Middle East," CIA Director Mike Pompeo said while speaking at the Foundation for Defense of Democracies' National Security Summit last Thursday. The Kurdish news site Rudaw reports that a member of Iran's Expediency Council, Ali Akbar Velayati, has claimed that "Iran has no role" in assisting the Iraqi government's takeover in Kirkuk. According to Reuters, a U.S. official confirmed that Tillerson's remarks were referring to the PMF and the influences of the Quds force, a special forces unit of Iran's Revolutionary Guards. 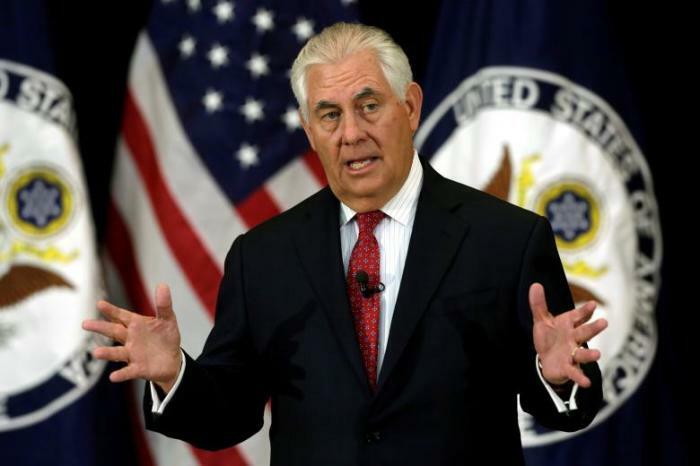 Tillerson's comment comes as representatives of the Christian community in Iraq and human rights activists have voiced concern about how Iranian presence in towns once populated by Christians before the Islamic State displaced hundreds of thousands of people from their homes in the Nineveh region in 2014 is intimidating Christians and preventing them from returning to their rightful homes. Nina Shea, a human rights lawyer who once served on the U.S. Commission on International Religious Freedom and now serves as the director of Hudson Institute's Center for Religious Freedom, told The Christian Post last month that the U.S. government should not take lightly the fact that "Iran is aggressively establishing schools and mosques and libraries and other structures within the main Christian towns." "What Iran does is give money to the Shiite majority and they buy the Christian's land," she added. "The Christians feel like they have no hope of getting back and they are intimidated by the Iranian militias in their towns and they sell out." "[Christians] are losing heart," Shea added. "They are on the brink of extinction and they are seeing Iran move in." In an op-ed published by Fox News earlier this month, Shea warned that Iran opened up a school in the Christian town of Bartella named after Ayatollah Khomeini. "Tehran also completed a mosque and library there. At the ribbon cutting ceremony, Iranian diplomats and Iraqi officials gave speeches. Iranian-backed militias flying sectarian flags man checkpoints in other Nineveh towns where Christians have not returned," Shea explained. "In other words, American aid policies are facilitating Iran's colonization of parts of Nineveh."